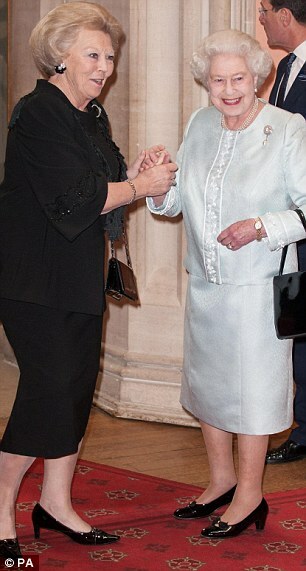 Yesterday afternoon her Majesty Queen Elizabeth II hosted a once-in-a-lifetime lunch at Windsor Castle. To celebrate her Diamond Jubilee, H.M. invited a selection of monarchs from across the world for an intimate lunch at Windsor. The three course meal showcased the finest English ingredients with a starter of poached egg and English asparagus, a main course of Windsor Lamb, and a desert of strawberries grown in Kent. While the menu was decidedly British, the rare occasion of hosting an event attended almost solely by reigning monarchs offered an opportunity for some imaginative place settings. Instead of using the more traditional name cards to indicate where each guest should sit, Queen Elizabeth opted to have a miniature flag of each monarch’s country at their seats. 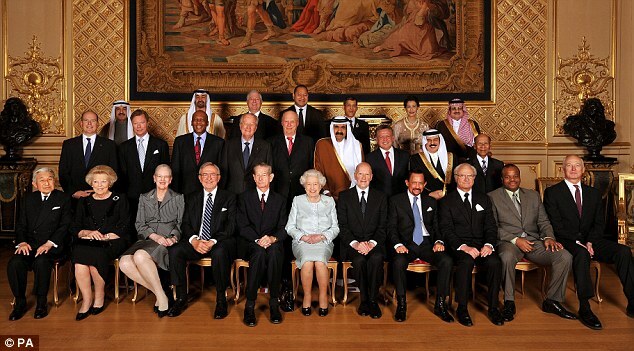 Front row (L-R): Akihito the Emperor of Japan, Queen Beatrix of the Netherlands, Queen Margrethe II of Denmark, King Pavlos of the Hellenes, King Michael of Romania, Queen Elizabeth II of England, King Simeon of Bulgaria, Sultan Hassanal of Brunei, King Carl XVI of Sweden, King Mswati III of Swaziland, Prince Hans-Adam II of Liechtenstein. Middle row (L-R): Prince Albert of Monaco, Grand Duke Henri of Luxembourg, King Letsie III of Lesotho, King Albert II of the Belgians, King Harald V of Norway, Emir Hamad of Qatar, King Abdullah II of Jordan, King Hamad of Bahrain, and King Abdul of Malaysia. Top row (L-R): Emir Sabah of Kuwait, Crown Prince Mohammed of Abu Dhabi, Crown Prince Alexander of Yugoslavia, KingTupou VI of Tonga, the Crown Prince Vajiralongkorn of Thailand, Princess Lalla of Morocco, and Prince Mohammed of Saudi Arabia. Prince William and Kate, Duchess of Cambridge, welcome Prince Albert and Princess Charlene of Monaco. Prince Philip, a Prince of Denmark himself, warmly welcomes Queen Margrethe II of Denmark. 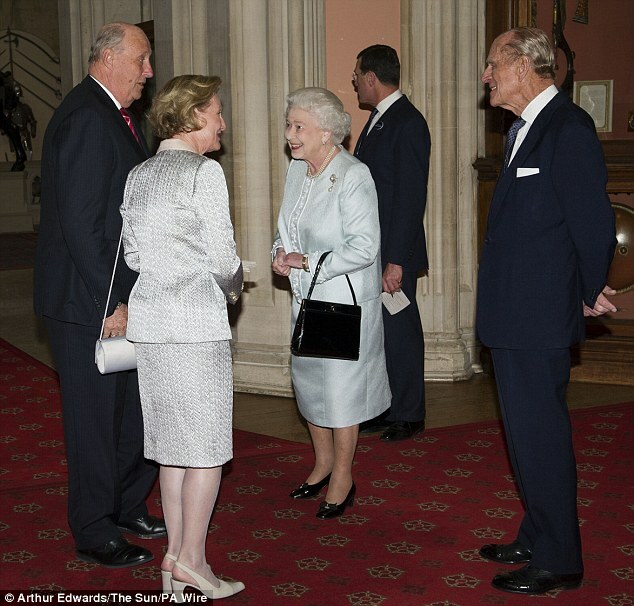 H. M. Queen Elizabeth II and Prince Philip welcome King Harald V and Queen Sonja of Norway. 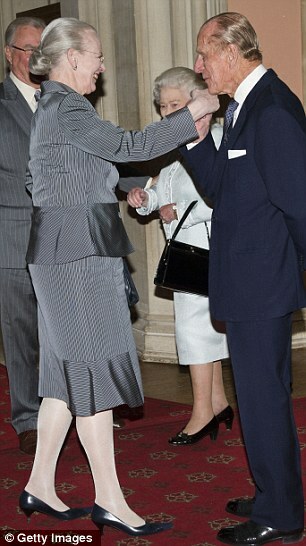 Queen Elizabeth warmly greets Queen Beatrix of the Netherlands.